Copycat Smashburger French Onion Burger - will have you saying "oui-oui"
You can make a copycat Smashburger French Onion burger at home. It is so easy to make this amazing burger at home. Smashburger makes some of the best hamburgers that you can buy. They are flavorful, made with fresh meat, and made fresh to order. Smashburger is unique in how they prepare their burgers. Smashburger smashes the meat into the grill while cooking. By smashing the meat onto the grill the flavor and juice get locked into the meat. Smashburger does not use ordinary ground beef for their burgers they use minced chuck steak. Using higher quality of meats means that you get a better burger. Their French onion burger is a fun new burger that they serve on their limited menu. 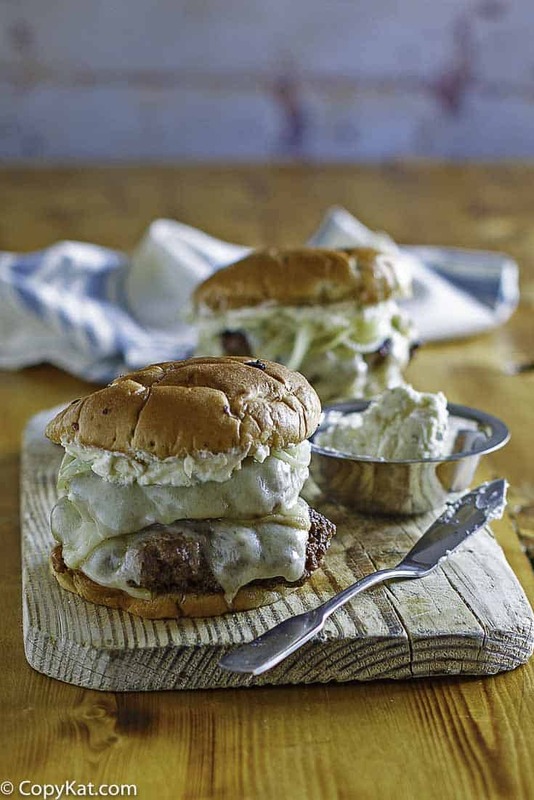 This burger features sauteed onions, Boursin cheese, swiss cheese, two patties all served up on a delightful onion bun. It’s not every day that you can find a burger that packs so much flavor in itself. This isn’t your ordinary burger, it is one that is extraordinary. The combination of Boursin and Swiss cheese you send up with a burger that is going to make you want to say “oui-oui”. If you have never purchased Boursin cheese it is a brand of cheese that combines Gournay Cheese and mouthwatering herbs and spices to create an array of delicious flavors—delicately wrapped in our signature foil to preserve freshness. I have to be honest here, I love Boursin cheese, a slice of it makes an ordinary grill chicken breast turns chicken into something extraordinary. Whenever I have guests over I love to serve up some Boursin cheese, the plate of Boursin cheese always comes back empty. The creaminess of this cheese is the perfect substitution for mayonnaise or mustard on a burger. You are going to love this flavor combination of the Boursin cheese, Swiss cheese, and grilled onions on a toasted onion bun. Prepare burger seasoning, and use for the recipe. In a small bowl combine the kosher salt, ground black pepper, and garlic salt.Saute onions with butter on the grill. Sprinkle burger seasoning on the onions. Cook the onions until they are tender. Do not brown the onions.Butter each of the buns and cook the buns on the grill. Cook the buns on the grill until they lightly brown.Form 8 balls of the burger meat. Heat the grill to about 350 degrees. Place the balls on the grill. Smash burger meat onto the grill. Season with burger seasoning. Cook for 2 to 3 minutes flip and continue to cook on the other side. 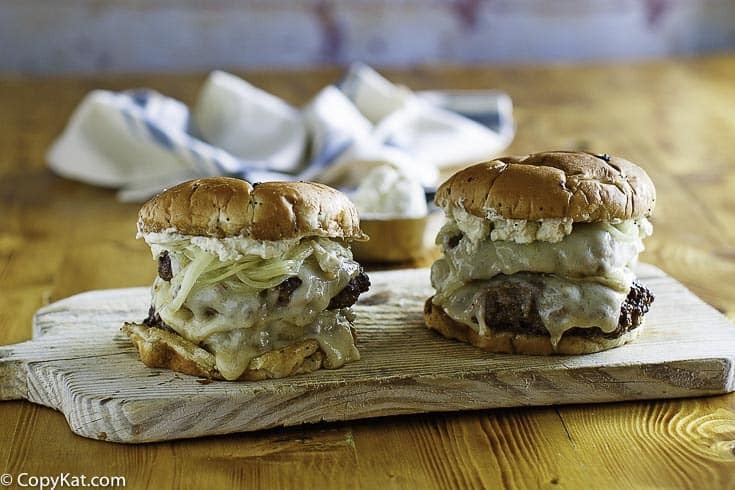 Place 1 slice of Swiss cheese on each burger while they are on the grill.Build the burger by building up from the bottom by adding the two burgers with cheese on each bun. Then top with grilled onions, and spread some Boursin cheese on the top bun. Top the burger with the top bun. Love A great burger? Try these Smashburger Recipes and more! You are going to love this French Onion Burger. Prepare burger seasoning, and use for the recipe. In a small bowl combine the kosher salt, ground black pepper, and garlic salt. Saute onions with butter on the grill. Sprinkle burger seasoning on the onions. Cook the onions until they are tender. Do not brown the onions. Butter each of the buns and cook the buns on the grill. Cook the buns on the grill until they lightly brown. Form 8 balls of the burger meat. Heat the grill to about 350 degrees. Place the balls on the grill. Smash burger meat onto the grill. Season with burger seasoning. Cook for 2 to 3 minutes flip and continue to cook on the other side. Place 1 slice of Swiss cheese on each burger while they are on the grill. Build the burger by building up from the bottom by adding the two burgers with cheese on each bun. Then top with grilled onions, and spread some Boursin cheese on the top bun. Top the burger with the top bun. The whole family gobbled these up! We can’t wait to try the Smashsauce. We have made these twice in the last week! We loved these burgers. We loved these burgers! Do more Smashburger recipes. My family make something similar with onions, but we eat it with barbecue. Kudos on the photo!!! That alone will tip the scales in favor of making this for Memorial Day cookout. Combine that with some smoked Baby Back’s and KFC coleslaw (with tarragon vinegar) and there will be smiles all around!! Thanks Steph for another home run!! Our go-to site. Thank you for the compliment 😉 Burgers always look good to me. I bet your ribs will be awesome 😉 I always love when you drop by the site!